Just the same as in our real life, a good signature on the web can add more personal touch and make you unique and trustworthy. If you are a blog writer, maybe you will need a signature at the end of a post. If you are sending out emails, you may need a special signature to replace your plain and boring texts. If you are making an e-book or a sales letter, a personalized signature can add more trustworthiness. So how do you design your own signature and use it online everywhere? One way is to get an exact copy of your signature. You can simply write your signature on a sheet of paper and then scan it and save the signature image and use it whenever you like. The second way is to draw your signature on your computer by using some designing software like Photoshop etc. and then save it to use later. The disadvantage of the ways above is that it takes some time and you may not get an ideal result. In this case, you can just try to write your name in a few fonts and you will be able to easily convert your name into impressive signatures. There are a lot of font websites scattered around the web that allow you to download fonts for free. Depending on your personality and preferences, you can choose and download a font you like. However, if you are serious about your signature, we suggest you check out myfonts.com, where there are many professionally made fonts for signature purposes like Signerica, Albion Signature, etc. To download free signature fonts, you can take a look at our free fonts collection, which offers more than 20,000 fonts in different categories. If you are looking for signature fonts that are of high quality (well kerned, broad character support, etc. 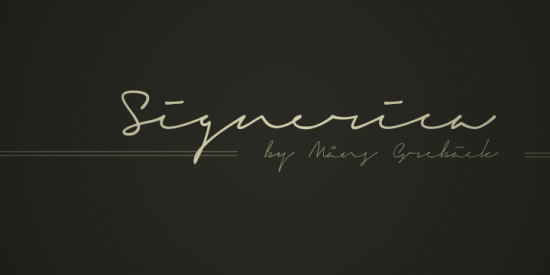 ), have a look at signature fonts at myfonts.com. If you don’t want the hassle of downloading and installing fonts, but just need simple designs in signature fonts. Check the tool below. Below is a collection of signature fonts. You can use the following tool to generate text images based on your selection of colors, sizes using signature fonts in seconds. To download the image, just right-click on the image and save. To embed images on web pages or forums, you can click on the "EMBED" button to get codes.